Baked Shrimp Scampi is tossed in a delicious garlic and butter white wine sauce, made in convenient foil packets, and is healthy, low-carb, gluten-free, and can be made Paleo and Whole30. This easy weeknight dinner recipe comes together in under 20 minutes, too! Shrimp scampi is one of those recipes I always forget about until I am at a fancy seafood restaurant. I see it on the menu and immediately need to order it! And if I don’t, I’ll spend days dreaming about that rich butter and garlic sauce with a hint of white wine, those plump, juicy shrimp, and that bite from the lemon and red pepper. I just might drive myself crazy! But in all honesty, it can be (and usually is!) a waste of money. After you see how quick and easy this baked shrimp scampi recipe in foil packets is to make and clean up, you’ll be able to curb those expensive restaurant cravings, too! Shrimp Foil Packets to the Rescue! What is so amazing about this baked shrimp scampi recipe is just that… it’s baked! Shrimp can turn pretty quickly from being perfectly cooked to hard and rubbery if you overcook them by just a minute or two in the skillet. 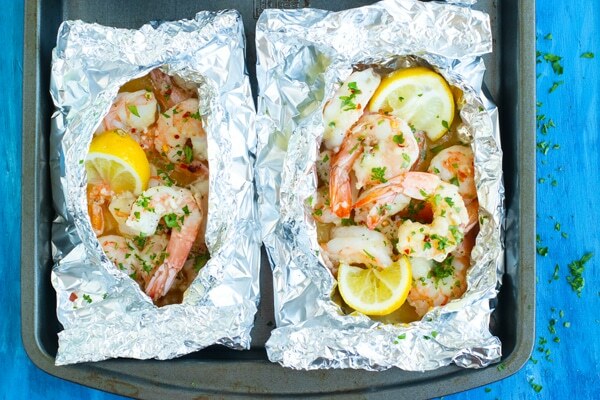 Putting our shrimp scampi in individual foil packets and baking them in the oven not only makes them extremely cute, but also pretty foolproof! But please note: If you get smaller shrimp than the size that is mentioned in the recipe below, please adjust your time in the oven for these shrimp foil packets! Shrimp scampi would be NOTHING without the delightfully rich and buttery sauce that it is tossed in. Before I started making baked shrimp scampi at home, I thought there was some voodoo magic that restaurants put into their shrimp scampi recipes. If you want to use ghee, learn how to make ghee here! 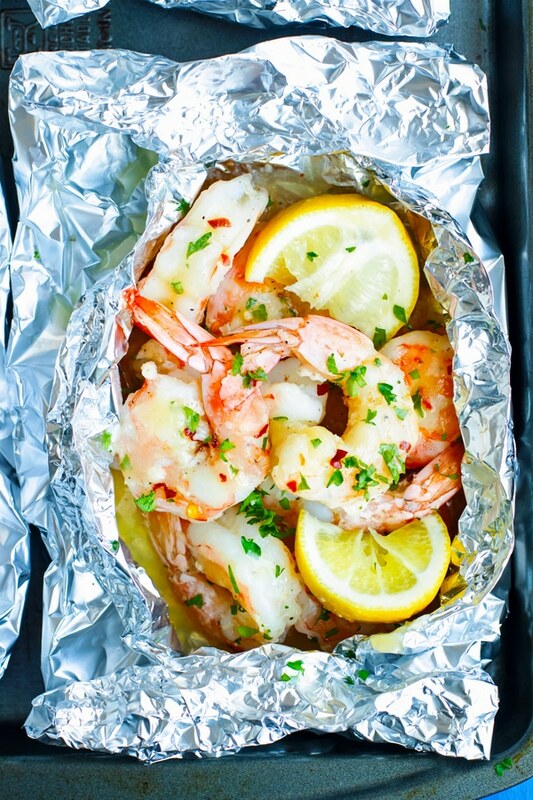 Garlic: Oh yes, you may not want to make these shrimp foil packets for a first date night! Lemon Juice: To give it that freshness. Red Pepper Flakes: Gives it a nice bite! Low-Carb and Keto Baked Shrimp Scampi Recipe! 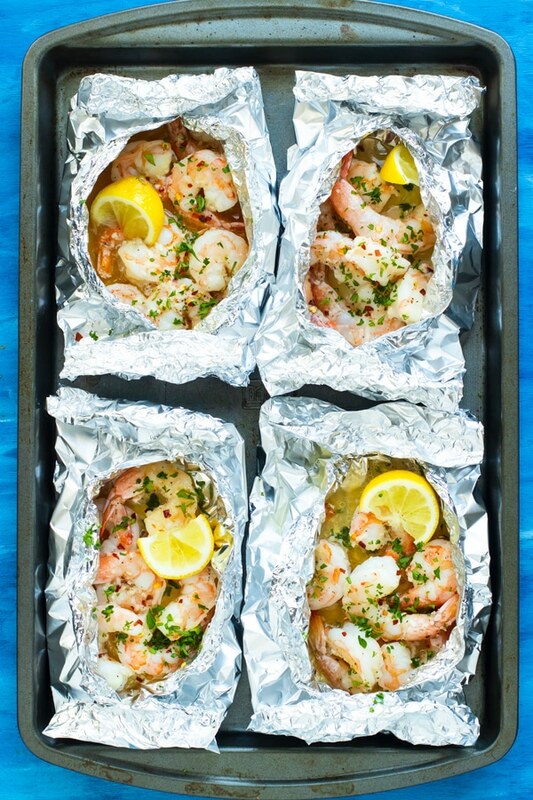 Not only is this drool-worthy deliciousness packed into neat shrimp foil packets, but it is also SUPER low-carb and a great keto dinner recipe. Baked Shrimp Scampi is tossed in a delicious garlic and butter white wine sauce, made in convenient foil packets, and is healthy, low-carb, gluten-free, low-carb, and can be made Paleo and Whole30. This easy weeknight dinner recipe comes together in under 20 minutes, too! In a small bowl whisk together the melted butter, garlic, wine, lemon juice, salt, and peppers. Place 6-8 shrimp in the center of the aluminum foil and pour ¼ of the butter/garlic mixture over shrimp. Bring the longer edges of the aluminum foil together and twist until just closed. (It’s OK to leave a little gap for ventilation while baking.). Roll up the shorter sides of the aluminum foil to make a foil packet. Repeat with the remaining shrimp, sauce and aluminum foil. 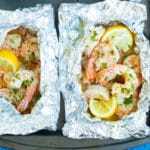 Place shrimp scampi foil packets on a baking sheet and bake in preheated oven for 10-12 minutes. Once shrimp are done cooking, serve with additional lemons and parsley. Enjoy! See this recipe in Meal Plan #6. *If you use smaller shrimp, make sure you decrease your cook time accordingly. **Best wines to use are Sauvignon Blanc, Pinot Grigio, or Viognier. *** If you are unsure about the safety of aluminum foil you can check out this awesome parchment-aluminum foil paper. It does not fold quite as easily as aluminum foil, but it still works great! 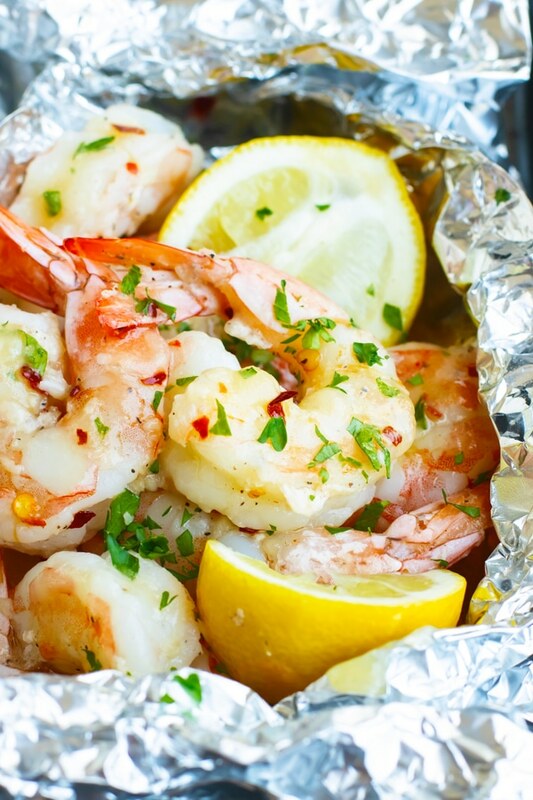 Want more recipes like these Baked Shrimp Scampi Foil Packets? Hi Vera! Personally, I do not like to freeze shrimp after they are cooked because the texture definitely changes once you defrost them. However, you can freeze them before you cook them and then bake them when you are ready to eat! It looked like you used pre-cooked shrimp in the video, is that what we are to use, or had that just been for the video. Hi Barry! Those are actually uncooked pink shrimp in the video (they do look like kind of like they’re cooked though!) So yes, definitely use uncooked shrimp. Thanks for asking!